Suzanne Homer is a Swiss born, British artist living and working in Newcastle. Her inspiration stems from the architecture she observed as she travelled through different countries whilst growing up. Zanna Designs was launched in April 2007, with the first collection of limited edition Giclee prints depicting Newcastle and Gateshead. To follow, were a range of greetings cards reproduced from her original art work. With a background in Printed Textiles and Surface Pattern Design, she sees her art as more of a starting point to her business. She hopes to make building blocks for the return to producing designs for fabric, which is where it all started in 2001, when she began her degree at Leeds College of Art and Design. Suzanne's illustrated, architectural inspired collages are created through the combination of illustration and computer graphics. Her aim is to create a story of rural and urban environments and challenge the eye of the viewer to give a different perspective of everyday scenes. The addition of the quirky colour schemes and collages is what turns her very traditional and realistic line drawings into an abstract style. 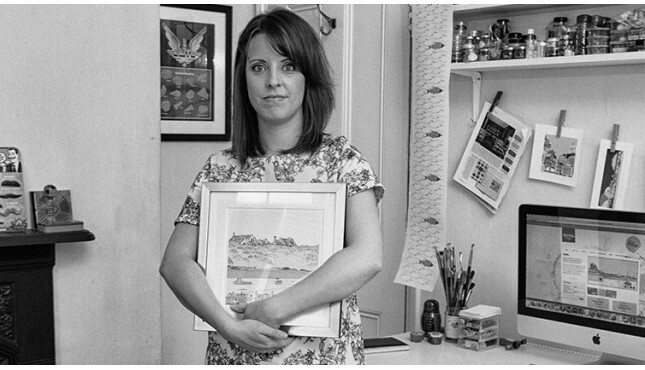 She currently sells her work in galleries and shops and has completed commissions for a range of customers from private individuals to Newcastle University where, one of her pieces of artwork was presented as a gift to Her Royal Highness The Princess Royal. So far, she has concentrated on producing art work of the North East of England but, she intends to widen her collection and include pieces from other parts of the UK. Suzanne always welcomes commissions. The newest of my collection. This picture was produced in order for me to enter the Northumberlan..
Another brand new piece in my Northumberland collection. I originally didn't like this piece and .. I have walked along the beach to Dunstanburgh many, many times. It is a place that is very close .. I love the beaches that we are so lucky to have in the North East and they have become a favourit.. This is one of my favourites. I was commissioned by the Biscuit Factory to design a collection fo..
Having spent many years living in Rothbury, Morpeth was a place that before learning how to drive.. This is one of my early collages. I had completed so many architectural prints by now, that I wan..
Limited edition Giclee printed on archival matt paper. Single mounted.Print image size: ..
Several artists were asked by a local gallery to complete some images that incorporated the Theat.. When I was completing this particular piece, I could not decide what colour the sky should be. So.. Safe Secure and Simple ways to pay for your purchase Highly secure CardSave is level 1 PCI DSS compliant and is an active member of the Payment Card Industry Security Standards Council, so you can be confident that you transaction is protected by the latest industry technology.